BP's Oiled Pelicans: "They Look Like Dead Angels in the Sand"
Alarm bells were going off over a month ago from reputable wildlife rehabilitators and veterinarians. Fledgling pelicans risked being abandoned by parents who had died or become incapacitated by the oil washing ashore in rookeries along the Louisiana coast. Those with compassion and common sense knew that the fledglings must be rescued or risk starvation. Louisiana wildlife officials wrung their hands, deferring to "higher-ups," quoting rules and regulations that the rookeries must not be "disturbed." At the time, this writer put a governor on her pen, when all she really wanted to write was that the rookeries were beyond being "disturbed." The rookeries were destroyed. And the juveniles were doomed. 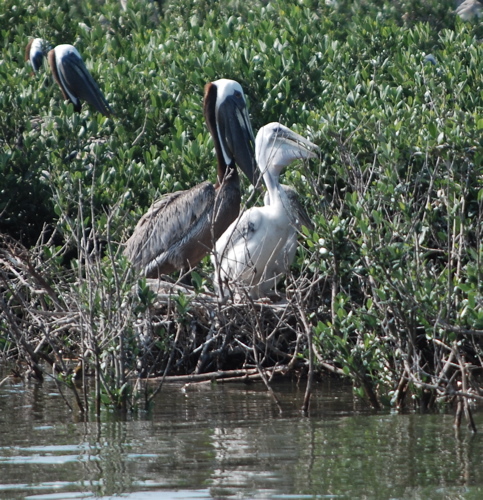 Juvenile and parent early June, Barataria Bay. Baby will eat up to 150 ponds of fish provided by parent. Now fish is oil-soaked and parent most likely dead. 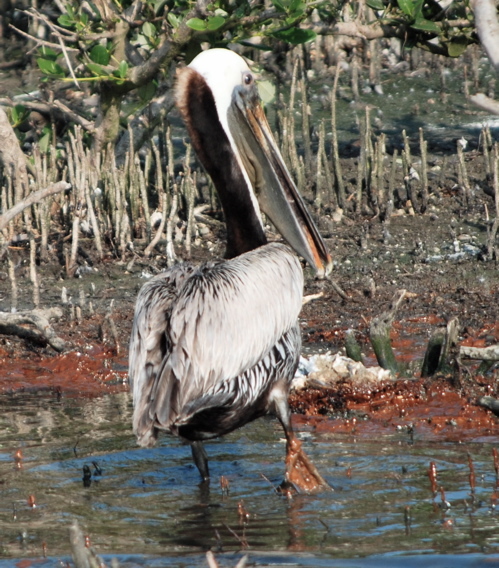 We had photos of adult pelicans wading through pools of oil and goo on the shores of Queen Bess and Cat Islands. Juveniles were in the nests, totally dependent upon their oil soaked parents for food and guidance. The parents were already dead in some cases. And so this writer remained silent, thinking there was nothing one person could do, and forgetting that sometimes it is just one who can make a difference. That person is New Orleans' photographer Jerry Moran, who made his way to Raccoon Island, one and one half hours by boat from Cocodrie, Louisiana, and documented what everyone feared would happen. Now the tragedy has unfolded because we have not raised our voices and screamed that this must stop. This is something we can do. We can rescue these juveniles, but we are afraid of bureaucracy and arrest and fines. Jerry has documented a preventable tragedy that should haunt all of us who have been silent. With an act of will from those with compassion, these babies can be rescued. Forget about Tri-State Wildlife Rehabilitation and BP owned contractors who are charging for the rehabilitation of every bird. There are compassionate veterinarians and trained rehabilitation specialists who would gladly take these birds for free. But, BP and the government will not allow it. Rehabilitation of wildlife has become a moneymaking government enabled bureaucracy with a bunch of federal sock-puppets taking orders from BP. Don't ask me to prove it. Look at Jerry's photos. I know you all can't charter a boat from Cocodrie, but you can communicate loudly and vehemently to your representatives in our crippled Congress. With enough noise, maybe your Senators and Congressmen will get up and walk instead of crawling before an administration that is disengaged and totally lacking in compassion for men, women and beasts. Note: Still photos here are author's and in public domain. Video "Song for the Gulf" is available for sharing, courtesy of LCN-TV, Houma, Louisiana.